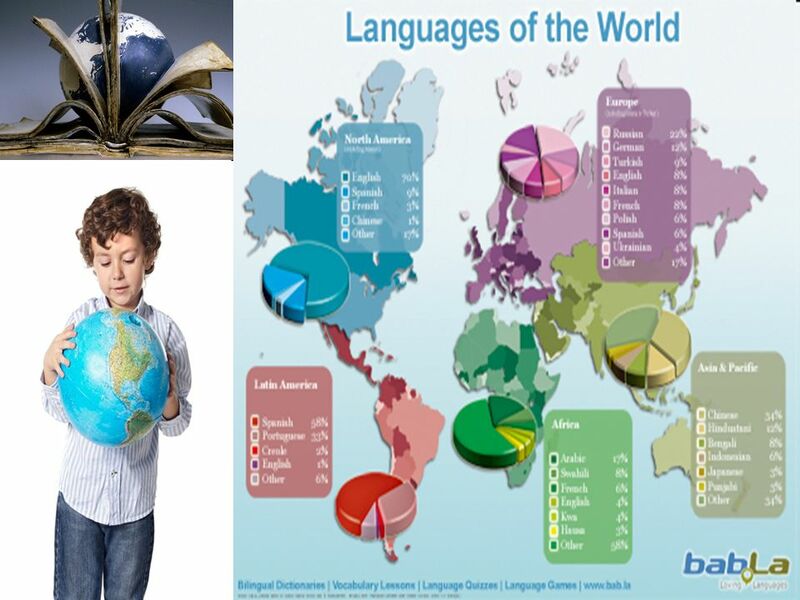 4 Today English is represented on every continent and in the three largest oceans: the Atlantic, Indian, and Pacific. 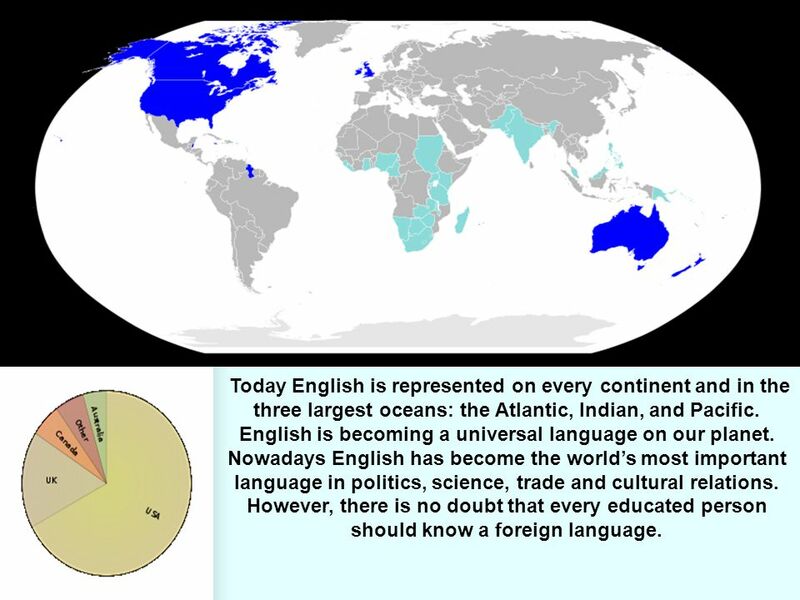 English is becoming a universal language on our planet. 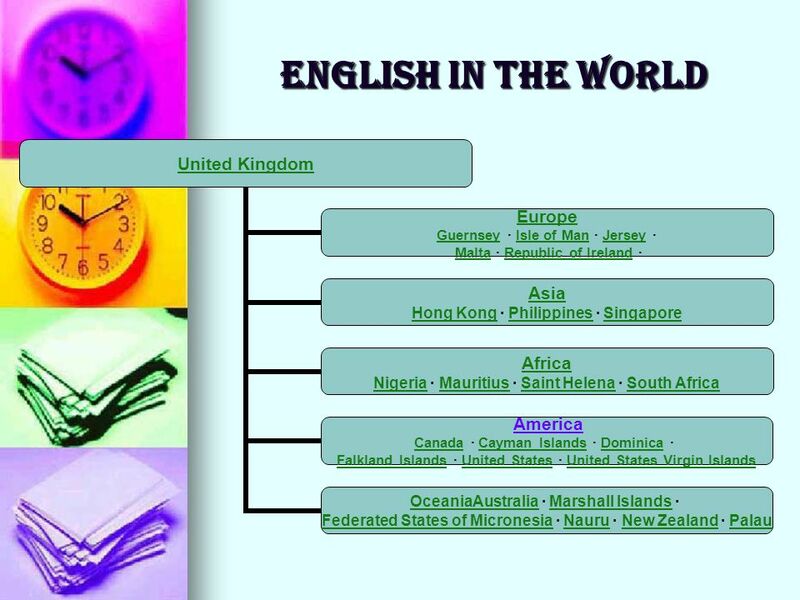 Nowadays English has become the world’s most important language in politics, science, trade and cultural relations. However, there is no doubt that every educated person should know a foreign language. 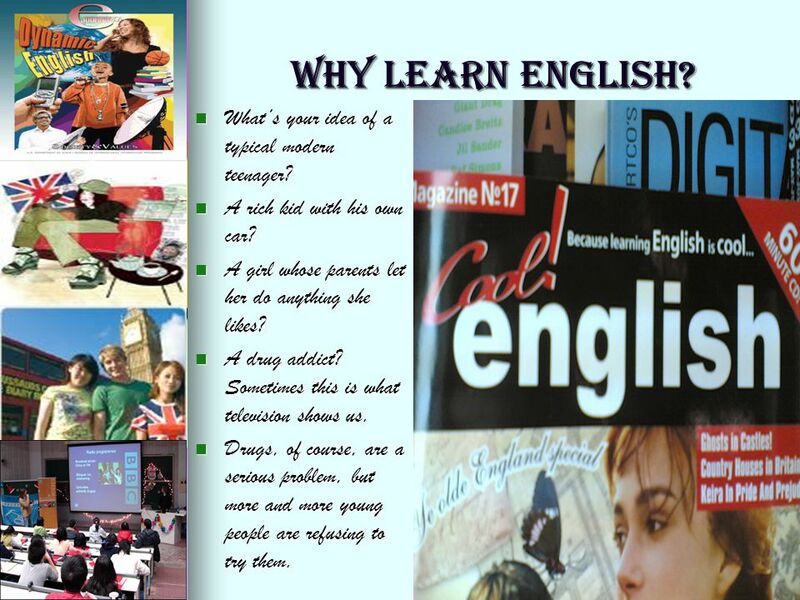 7 WHY LEARN ENGLISH? What` s your idea of a typical modern child? Rather noisy, perhaps? With too many expensive toys, a mouth full of chewing gum, and no respect for adults? A child who’s never happy except when watching television? This many be true. But most of them are full of energy and confidence, ready to go out and make their own way in the world. 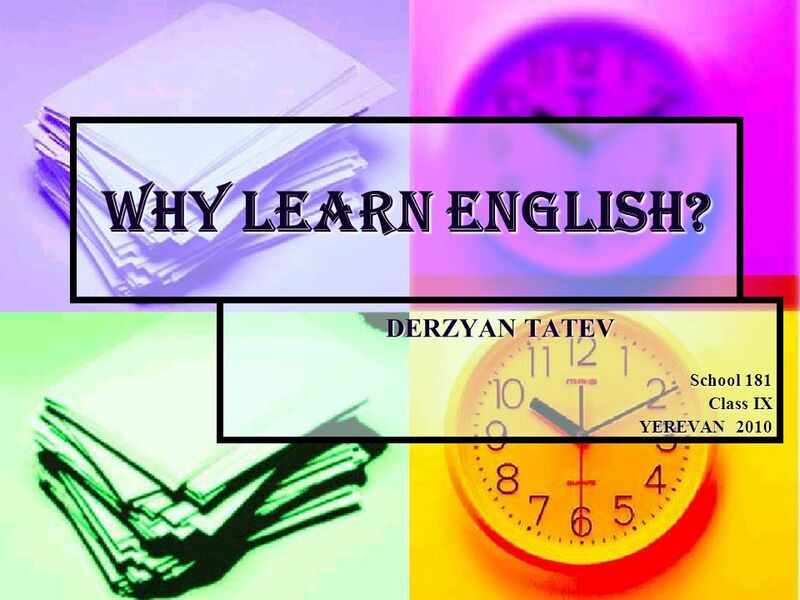 8 WHY LEARN ENGLISH? What’s your idea of a typical modern teenager? A rich kid with his own car? A girl whose parents let her do anything she likes? A drug addict? Sometimes this is what television shows us. Drugs, of course, are a serious problem, but more and more young people are refusing to try them. 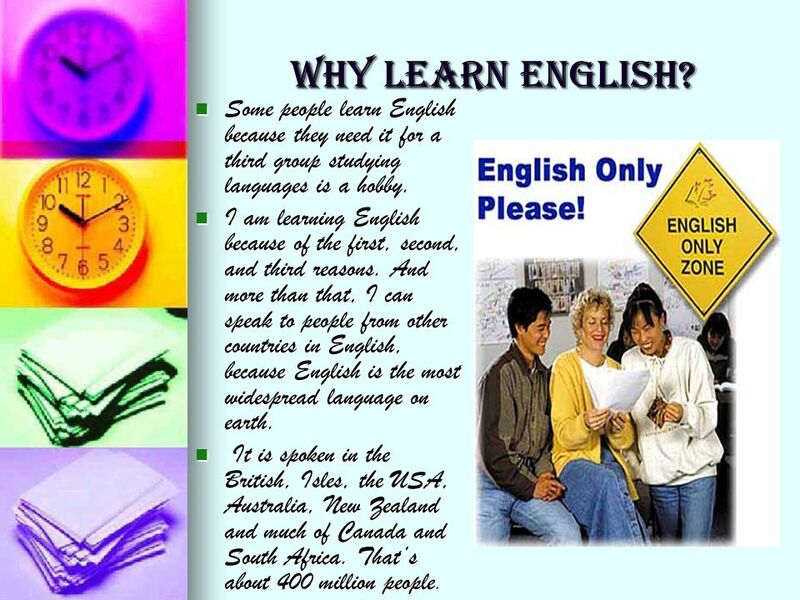 9 WHY LEARN ENGLISH? 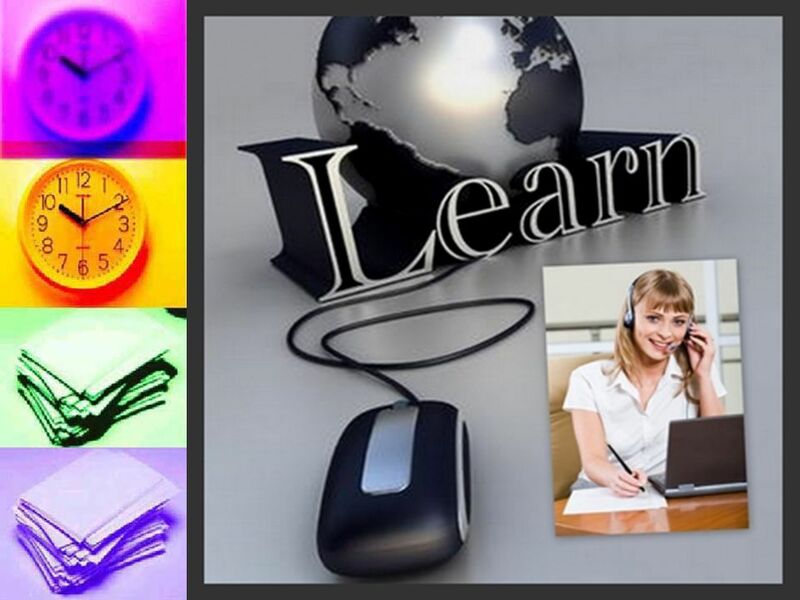 Some people learn English because they need it for a third group studying languages is a hobby. I am learning English because of the first, second, and third reasons. And more than that, I can speak to people from other countries in English, because English is the most widespread language on earth. It is spoken in the British, Isles, the USA, Australia, New Zealand and much of Canada and South Africa. That’s about 400 million people. 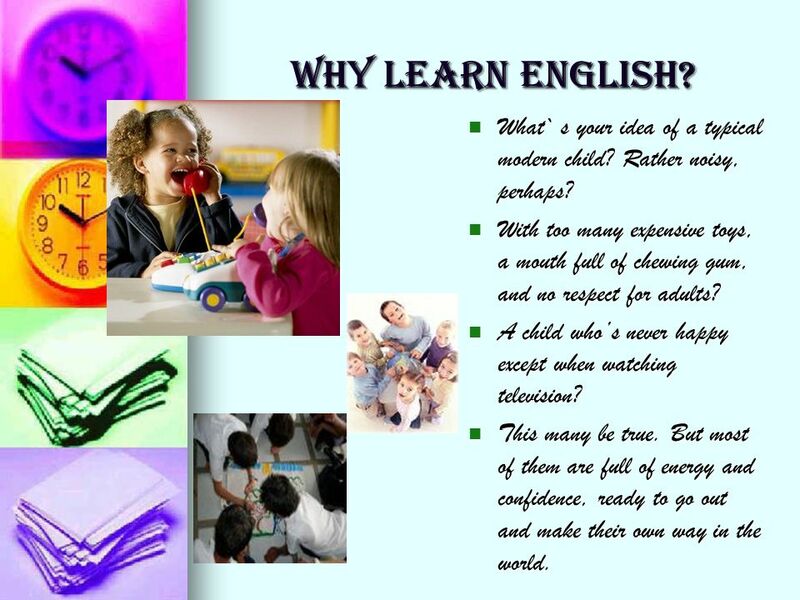 10 WHY LEARN ENGLISH? I want to be successful in life, so it is necessary to know English. I am happy that I am able to associate with people all over the world because all of them speak English well and are eager to learn as much as possible about life in Russia and our history and culture. English is a real of mine because I can books and periodicals in the original, go on sightseeing tours and understand TV and radio programs. 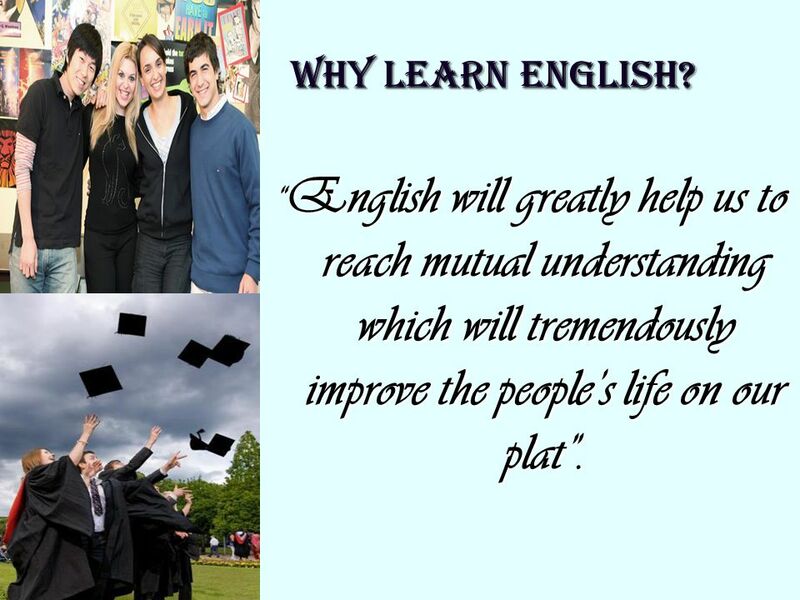 English makes people’s lives more fruitful, interesting and enjoyable. 11 WHY LEARN ENGLISH? “English will greatly help us to reach mutual understanding which will tremendously improve the people’s life on our plat”. Download ppt "DERZYAN TATEV School 181 Class IX YEREVAN 2010"
Senior English for Students Book 1A Unit 2 Reading No.66 Middle School. 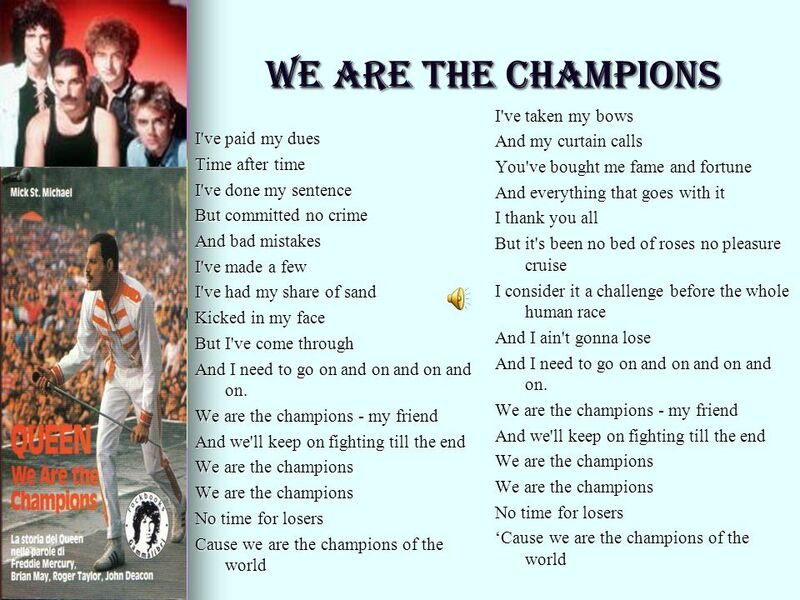 QUEEN WE ARE THE CHAMPIONS Testo di Freddy Mercury. Div. 18. My dad’s profession: Businessman, he works at a company called “Westfraser” the company sells lumber. He’s responsible to sell lumber to China. We are the Champions!. I’ve paid my dues… Time after time. Geography Challenge #1 Review the World / US – First 13. Continents and Oceans Grade 3. What is the only Super Power today? F-22 Military PoliticalEconomic Three types of Power to be a superpower. English – the language of the world Ashereva Alexandra 8 А School 3 Ershov 2011. The Earth needs a friend, doesn't it?  (February 1, May 22, 1967) Langston Hughes was an African American writer and poet from Joplin, Missouri. He lived in Kansas with his grandmother. BAKI HUMANITAR KOLLECI SHUSHAYEVA SVETLANA.